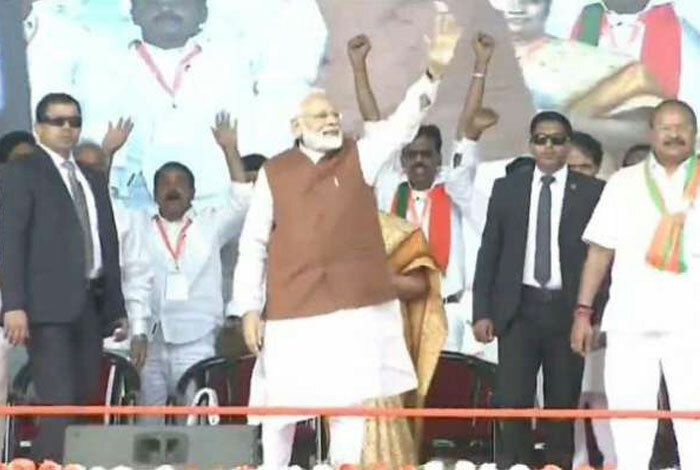 Amid intense protests of TDP activists against PM Narendra Modi's rally scheduled in Guntur on Sunday, the PM went on sarcastic on TDP chief Chandrababu Naidu's corruption practices in the state. Addressing to thousands of BJP's loyalists in Guntur, Modi admitted that Naidu is senior to him, but sarcastically. "Yes, you are senior in backstabbing your father-in-law. You are senior in changing political parties. You are senior in taking U turns. You are senior in forming various alliances. Your are senior in losing elections. You are senior in tying up with those political parties who tended to be your rivals," says Modi amid huge response from BJP supporters. In the meanwhile, Modi took a dig at Naidu's abuses against him. "He is using every abuse found in dictionaries to attack me. Somehow, it's felt he is humiliating Telugu people's culture with his filthy language." Modi said. "I am giving sleepless nights to Naidu as I had kept on asking account to every rupee spent by him," Modi quips.